When I talk about the benefits of building a business with a social mission, consumer support and loyalty come up a lot. One of the rewards of being a socially driven company is that consumers like to buy from you and will often take it upon themselves to share your mission with others. A new company out of California is reversing this proposition by giving companies the tools to incentivize sustainable behavior in consumers. Through Bolder, companies challenge readers to complete a certain action each week. Readers who complete the action and report on it with a Tweet-length story are rewarded by the challenging company with a product voucher or coupon. Bolder’s concept accomplishes several goals: it gives individuals manageable, singular sustainability challenges that they might incorporate into their lives, it acts as a product coupon and discount site, it promotes companies organically through social media channels, and it offers companies a more integrated and fresh way to engage consumers around their core brand and message. 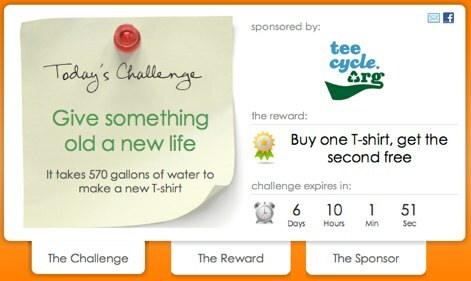 The site is still young and participation is low right now (Timbuk2’s sponsored challenge had 90 participants), but it will be interesting to see its growth and further applications, e.g., can utility companies offer discounts for people who install usage meters or could classrooms carry out larger group challenges? you always find such interesting stories to share. thanks. Idea sounds nice, but it seems like it didnt work, cause bolder doesn t exist anymore….